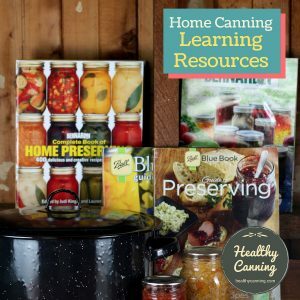 Promoted from time to time as a “new” home canning technique, “oven canning” is actually an old technique. It has been around since at least the 1920s — and it has been discredited and advised against since the 1940s. 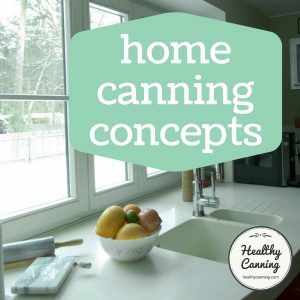 It involves “baking” your filled jars of food in the oven, instead of water bath processing them, or pressure canning them. 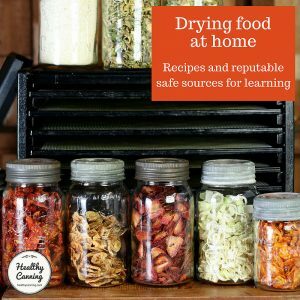 Where is this dry vs wet oven canning notion coming from? The main problem is that the food inside jars doesn’t get hot enough consistently enough to ensure that proper heat penetration has taken place to ensure the biosafety of the product inside the jars. The folklore of homemaking has another bad method that continues to surface: trying to process foods by baking them. ….Dry heat just plain cannot produce the same effect as boiling water, either at atmospheric pressure or under extra pressure, can.”  Hertzberg, Ruth; Greene, Janet; Vaughan, Beatrice (2010-05-25). Putting Food By: Fifth Edition (p. 61). Penguin Publishing Group. Kindle Edition. Some advocates of oven canning argue that the 120 to 150 C (250 F to 300 F) setting on the oven dial means that you are getting higher temperatures than inside a pressure canner. The problem is the temperature on your oven dial is not the same as the temperature inside foods in the oven. Take a pork loin roast, bone-in, in an oven set to 180 C / 350 F / Gas mark 4 to 5. For well-done, you cook the roast 25 minutes per 500 g (pound). A small 2 kg (4 pound ish) roast will want 100 minutes ( 1 hour 40 minutes) for well-done. At which point, a meat thermometer inserted into the pork should register about 71 C / 160 F. So even though the oven was set to 180 C / 350 F , after 1 3/4 hours the internal temperature of the food is not even half that: 71 C / 160 F . The inside of the food is nowhere near the dial temperature selected. The same difference occurs inside jars. Even if you can get something to boil inside a jar in the oven, the contents of that jar will not get hotter than 100 C / 212 F. It can’t as there is no pressure in an oven. That’s nowhere near enough to kill off botulism spores that could be present in low-acid foods such as green beans or meat. Occasionally people ask about processing jars in the oven. 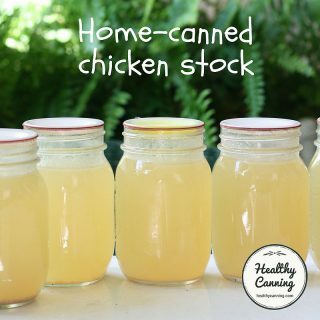 They claim a friend or neighbor promotes it as a simple method of canning. What they fail to understand is that oven heat is not the same as heat from a boiling water bath or from steam in a pressure canner. First of all, placing jars in the dry heat of the oven may cause the glass to crack and shatter causing injury to you. The Jarden Company that manufacturers most canning jars in this country states emphatically that it is not safe to heat glass jars in the dry heat of an oven. Jars are not designed to withstand oven temperatures and can break or even explode causing injury from broken glass. Secondly, dry heat is not comparable to the moist heat of a boiling water bath. Processing in an oven will not heat the contents in the coldest part of the jar in the same way as boiling water. Thirdly, oven heat will not increase the temperature inside the jar above boiling to be adequate to destroy botulism spores in low acid foods. Only in the enclosed conditions of a sealed pressure canner will you be able to increase the internal temperature to 240°F. Oven canning is not recommended! ”  Zepp, Martha. Avoid … Open Kettle or Oven Canning. Penn State Extension. 29 May 2014. Accessed March 2015. 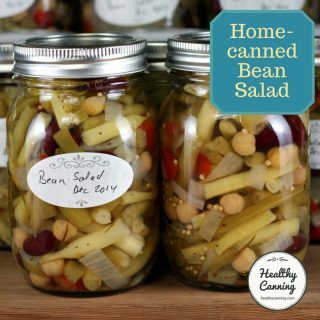 Using the oven method is NOT a recommended method of canning for green beans or any other food. It is dangerous because dry heat is slow to penetrate into jars (so recommended process times would not be enough), temperatures inside ovens vary (so a standard process time would be indeterminable), and no reliable, research-based safe process times have been developed for oven canning.”  Christian, Kasey. Green Beans and Botulism. National Center for Home Food Preservation. August 2014. Accessed March 2015. One blogger says it’s a hotly debated topic. There might be a raging debate in that person’s cranium, but in the outside realm of reality, where all the accepted professionals and authorities lives, the debate has been settled for 80 years: don’t touch oven canning with a 10 foot pole. For oven canning, just pre-heat the oven then turn it off and stick the jars in. If someone has the bad habit of oven canning, nothing is going to break them of it, it seems, and they will fight back savagely to defend it. 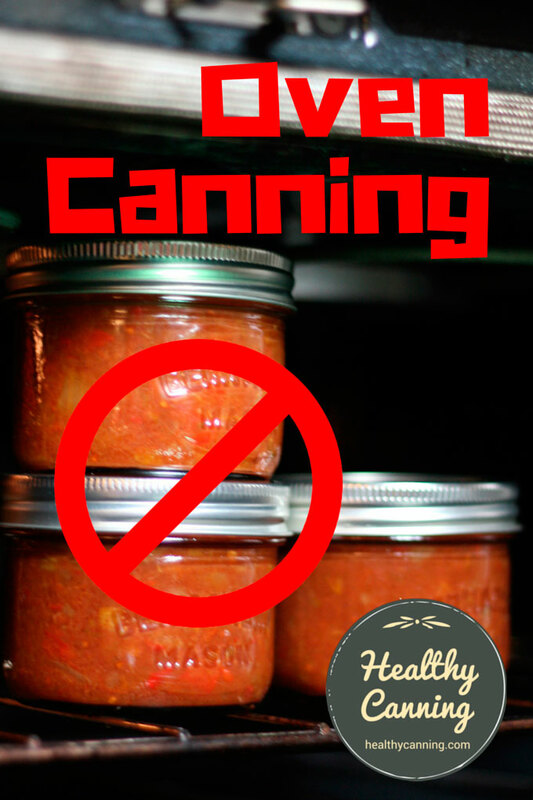 If you are just starting canning, don’t acquire this bad habit. Some people use oven canning to seal jars of dry goods. Oven canning dry things can actually shorten the lifespan of items like grains, flour, pasta, nuts, etc because the heat speeds up the process of their going rancid. Instead of oven canning, many preppers recommend looking at vacuum storage instead. Note that dry oven canning of nuts is specifically recommended against now; one of the specific risks is salmonella. Can I can shelled nutmeats? We no longer recommend canning a dry pack of shelled nutmeats at home. The previous canning process from the University of Georgia was a way to create a vacuum-sealed jar, but there is no documentation for any microbial sterilization that might have been taking place. More recent research has shown that some species of Salmonella are tolerant of drier (low water activity) conditions, and based on this information, canning nutmeats in a dry pack could be potentially hazardous using the directions we previously had if any condensation or moisture pockets formed inside the jar. 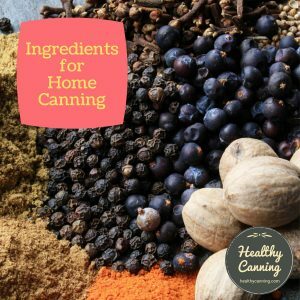 There is not a substitute canning process for preserving dry packs of nutmeats at this time. There are other options for vacuum sealing of dry meats for either room or freezer storage, using small appliances which pull air out of packages before sealing.”  National Center for Home Food Preservation. FAQ. Accessed March 2015. Oven canning has been advised against for over 80 years now. Food was baked in a jar on its own, then after baking the jar was filled with hot liquid and then sealed. It was used for fruits other than light coloured fruits. Not for tomatoes. The oven was heated to 120 C / 250 F / Gas Mark 1/2. Pack fruit in jars with no liquid. Lids put on but not secured on with either bands or clips. Put in oven; baked for amounts of times called for. When done, remove a jar from oven, remove lid, top up jar immediately with boiling water or syrup, put lid back on and secure lid down.”  Harrison, John. How to Store Your Home Grown Product. London: Constable and Robinson. 2010. Chapter 7. Food was baked in a jar topped up with liquid, then after baking the jar was sealed. Was advocated for fruit and tomatoes. The oven was heated to 150 C (300 F / Gas Mark 2). Bottles filled and lids put on but not secured on with bands or clips. Bottles put in oven on top of something in case they boiled over. Baked for processing time, then lid fasteners applied to clamp the lids down and get them to seal as they cooled. Bramwell, Leigh. Ways to satisfy your inner squirrel. Whangarei, New Zealand: The Northern Advocate. 23 May 2011. The whole technique is very dated, but is unfortunately revived from time to time by an unwary blogger. It’s possible it is being picked up from a book titled, “How to Store Your Home Grown Product” by John Harrison ( London: Constable and Robinson. 2010. Chapter 7.) He in turn appears to be picking it from an earlier book, perhaps from Good Housekeeping UK in 1964. Good Housekeeping’s Jams & Preserves. London: The National Magazine Co. 1964. page 22 . For the record, here is a book on oven canning from 1928. It was put out by the Lorain Oven Heat Regulator company. The heat regulator they made and advertised was what we would now call a thermostat. Shank, Dorothy E.. Lorain Oven Canning. Cleveland, Ohio: American Stove Company. 1928 . 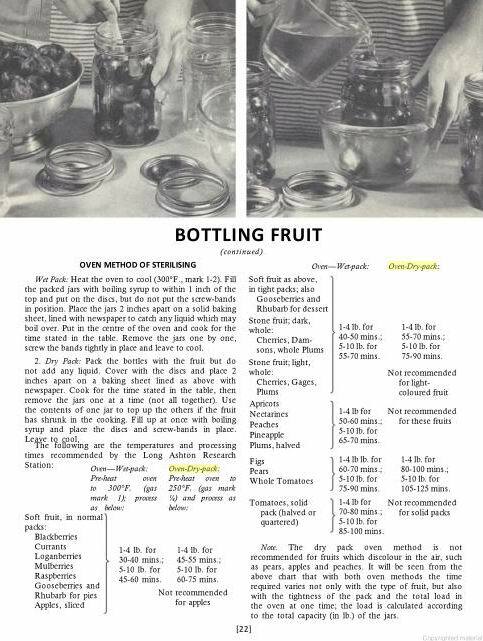 Note that the book says, “Increase the length of the processing period 20% when canning at high altitudes.” (Page 4). People advocating oven canning today don’t even take altitude into account. 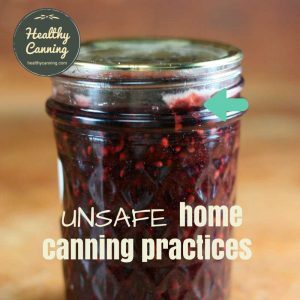 Be that as it may, despite that caution, all of their canning advice should be referenced as a historical artifact only and be deemed unsafe. 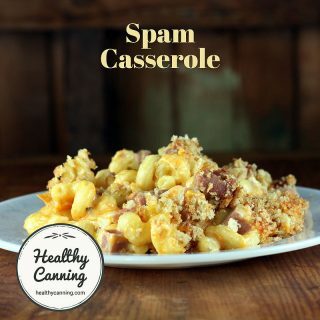 Oven Canning: Fruits and tomatoes are particularly well suited to this method of canning, although other vegetables may be canned successfully if acid is added, and the time of processing is sufficiently long, in an oven with a heat control appliance.” [Ed. A “heat control appliance” was a thermostat. We assume that all stoves have one now, but that was not the case in the 1930s.] Gilbert, Muriel Dundas. Successful Home Canning. Michigan Extension Bulletin No. 132. May 1933. Page 6. Accessed March 2015. 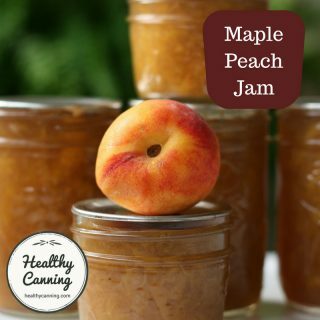 Oven canning has these disadvantages: Juice bubbles out or steams away; peaches and pears are likely to darken. You can do a more dependable jof of canning fruit in a boiling water bath. 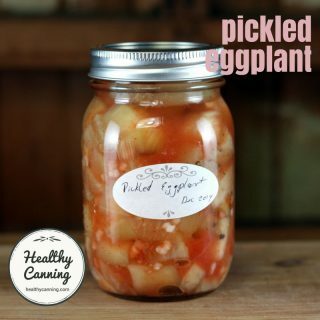 For the vegetables that need high heat to kill bacteria, oven canning is not safe. Even though the oven goes to 250 F or higher, food inside the glass jars stays at about the boiling point.”  Wartime Canning of Fruits, vegetables. USDA Bureau of Human Nutrition and Home Economics. Washington, DC. June 1943. This is in response to your inquiry regarding oven canning. As you no doubt know from reading our canning bulletin, copy enclosed, we recommend only the steam pressure method for canning nonacid vegetables and meat. We believe that the water bath method is for acid foods, although the oven may be used for processing them. The dry heat of the oven penetrates the contents of the jar more slowly than does heat from the boiling water. 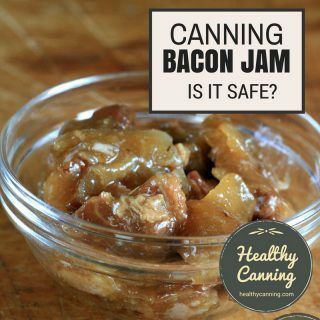 For this reason processing times for acid foods canned in an oven must be longer than when canned in a water bath. We have not issued processing times for this method, however. The temperature of food does not go high enough when processed in the oven to destroy some types of spoilage bacteria that may be present in nonacid foods. There are some disadvantages to the oven method. Juice may boil out and unless the fruit is well covered with sirup [sic] or juice, it has a tendency to discolor on the surface.”  Shank, Dorothy E. In Charge of Food Utilization Investigations. USDA Bureau of Home Economics. Letter to Ruth Current, Extension Agent in North Carolina, 18 March 1943. 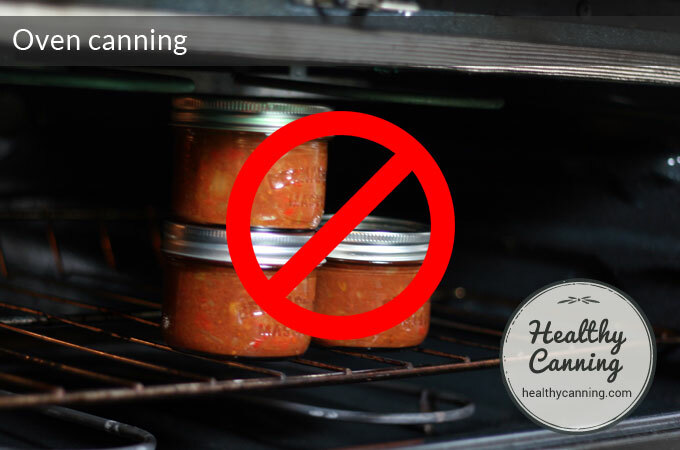 Oven canning is not recommended because of the danger from exploded jars and because many oven regulators are not accurate enough to keep a constant temperature.”  Cameron, Janet L. and Mary L. Thompson. 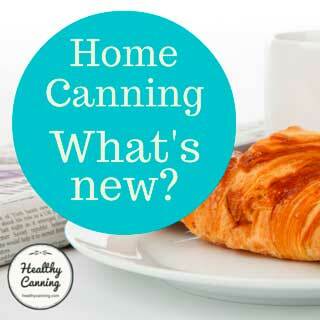 Canning for the Home. Bulletin No. 128. Virginia Agricultural and Mechanical College and Polytechnic Institute and the United States Department of Agriculture, Cooperating Extension Division. Revised June 1944. Page 4. The origins for the application of oven heating to home canning seem rather vague; however, a wide distribution of directions for this procedure came from manufacturers of ranges, glass jars or other related equipment (Haddock, 1933; Tanner, 1934; 1935a; 1935b). USDA did recommend oven-processing in their consumer publications from 1931 through 1942 (Stanley, 1931; Stanley et al, 1942). In 1931, the revision of Farmers’ Bulletin No. 1471 by Stanley (1931) introduced a discussion of oven processing. Stanley states the recommended temperatures were 250F and 275F, free circulating of air around jars was important, and that juices may boil out of the jars. A shallow pan in the bottom of the oven under the jars could be used to catch these juices. It was recommended to begin timing the process as soon as jars were placed in the oven and to process jars 50 percent longer than for boiling water canning. Jars were to be removed from the oven at the end of the processing period. The same altitude corrections were to be made as for boiling water canning. Several studies stressed the possibility of jar explosion as well as spoilage resulting from poor heat penetration. Studies at the Indiana Agricultural Experiment Station in 1930, as reported by Tanner (1934; 1935a; 1935b), showed that temperature inside jars do not rise above 212F. In addition, come-up time was very long: a jar of water with an initial temperature of 68F, processed in an oven at 275F, required 95 to 110 minutes to reach 212F. This meant two-thirds of the process time for some foods expired before maximum interior temperatures were reached. Higher initial temperature slightly reduced come-up time. Steinbarger (1931) reported studies conducted in the USDA Bureau of Home Economics on heat penetration rates associated with oven canning. Rates varied with consistency, initial food temperature, oven temperature and jar size. Quart glass jars were processed in 250 and 275F ovens. The maximum temperature reached in these jars was 212F, except for some fruits with high sugar content which were a few degrees higher. Sealing jars to hold in pressure caused breakage, so jars could not be fully sealed before processing. The Bureau concluded that this method could be used for acid fruits and tomatoes. All foods required excessive come-up times (55-95 minutes), and higher initial temperatures slightly decreased come-up time. Similar results were reported by Tanner (1934; 1935a; 1935b), who also demonstrated that a five-hour process in an oven at 135C (275F) failed to destroy spores of C. botulinum. Although oven canning is still practiced by some and is occasionally recommended in print, research data from the 1930 decade was enough proof of its unacceptability. Haddock (1933) also demonstrated that initial temperatures of jar contents affect come-up time and the maximum temperature of food was 212F. Haddock concluded that oven canning was influenced by many variables and should not be recommended. Variation between ovens was excessive, and come-up time from 113 to 212F for pint jars in different ovens under the same conditions ranged from 37½ to 120 locations within the same oven cavity. Fluctuations in oven temperature resulted in liquid loss from jars. Recommended processing schedules were also inadequate. Heat penetration data and other parameters studied in the 1930s demonstrated that oven-processing was not safe. In publication AWI-93 dated 1944, USDA issued a warning against oven canning. The low interior jar temperature and possible physical accidents were cited as to why the method was dangerous.”  Andress, Elizabeth L and Gerald Kuhn. Critical Review of Home Preservation Literature and Current Research. IV. Equipment and its Management – History and Current Issues. Athens, GA: University of Georgia, Cooperative Extension Service. 1983. 1. ↑ Hertzberg, Ruth; Greene, Janet; Vaughan, Beatrice (2010-05-25). Putting Food By: Fifth Edition (p. 61). Penguin Publishing Group. Kindle Edition. 2. ↑ Zepp, Martha. Avoid … Open Kettle or Oven Canning. Penn State Extension. 29 May 2014. Accessed March 2015. 3. ↑ Christian, Kasey. Green Beans and Botulism. National Center for Home Food Preservation. August 2014. Accessed March 2015. 4. ↑ National Center for Home Food Preservation. FAQ. Accessed March 2015. 5. ↑ Harrison, John. How to Store Your Home Grown Product. London: Constable and Robinson. 2010. Chapter 7. 6. ↑ Bramwell, Leigh. Ways to satisfy your inner squirrel. Whangarei, New Zealand: The Northern Advocate. 23 May 2011. 7. ↑ Gilbert, Muriel Dundas. Successful Home Canning. Michigan Extension Bulletin No. 132. May 1933. Page 6. Accessed March 2015. 8. ↑ Wartime Canning of Fruits, vegetables. USDA Bureau of Human Nutrition and Home Economics. Washington, DC. June 1943. 9. ↑ Shank, Dorothy E. In Charge of Food Utilization Investigations. USDA Bureau of Home Economics. Letter to Ruth Current, Extension Agent in North Carolina, 18 March 1943. 10. ↑ Cameron, Janet L. and Mary L. Thompson. Canning for the Home. Bulletin No. 128. Virginia Agricultural and Mechanical College and Polytechnic Institute and the United States Department of Agriculture, Cooperating Extension Division. Revised June 1944. Page 4. 11. ↑ Andress, Elizabeth L and Gerald Kuhn. Critical Review of Home Preservation Literature and Current Research. IV. Equipment and its Management – History and Current Issues. Athens, GA: University of Georgia, Cooperative Extension Service. 1983. 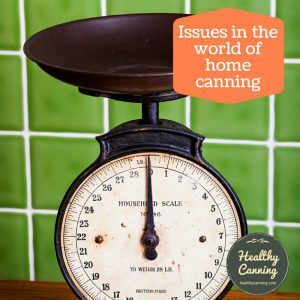 All home canning recommendations from reputable sources for low-acid foods were developed using certified pressure canners. There are none for ovens. 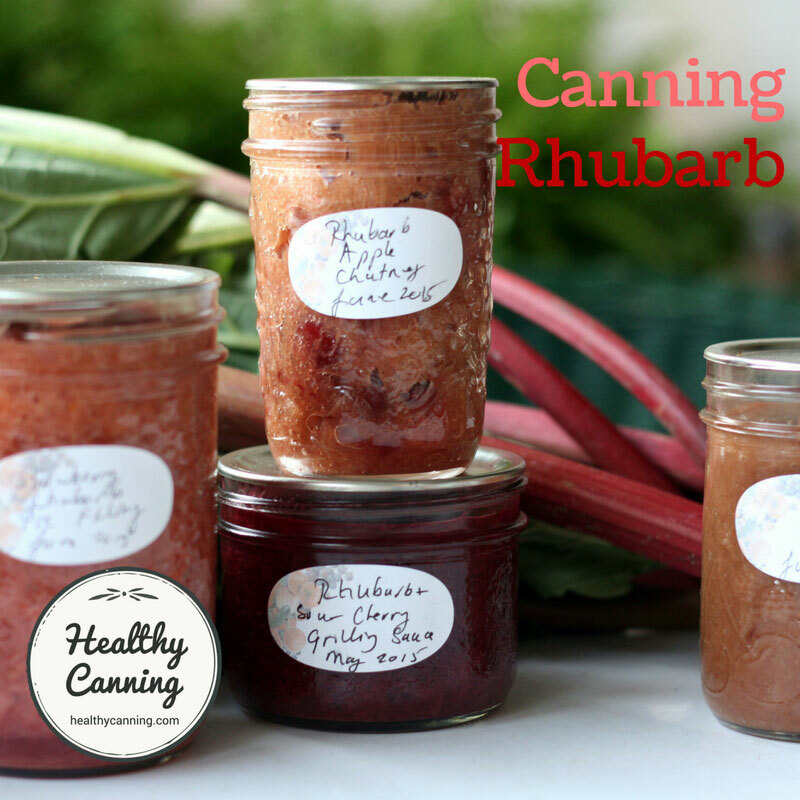 If you are canning commercially, you should check with a process authority (e.g. https://www.aardvarkassoc.com/ ) on acceptable methods. From my experience with baking various ceramics and metals for a variety of purposes, I’d guess that the time required to get quart jars of homogeneous organic matter hot all the way through without risking shattering the jars or overheating the outer layers would probably be about 6 hours, maybe as much as eight. So it’s actually going to be slower than a water bath. As for it being like a mini-pressure-canner, theoretically it could work, but you’d have to put between 20 and 30 pounds of weight on the lids and hope the jars didn’t have any imperfections since a pint jar would have about 400 pounds of force on its walls. Glass is pretty strong, so a perfect jar could probably take it, but it doesn’t take much of a nick, chip, or hairline crack to ruin that, and one exploding jar would probably generate enough shrapnel to damage the ones around it, so you could end up with quite a bomb inside your oven.